Whisper the sweetest words across my soul and you'll make my heart sing! Write me a poem about love and I'll call it a heart song. - Deborah Fletcher Mello The compilation of poetry and short stories from the 2018 Diamond Literary Foundation Poets and Writers Collective includes the talent of Ivana Arnold, Sharon L. Blount, Kay Edmondson, Brianna Jazmia, Victoria Kennedy, Anita L. Roseboro-Wade, Peggy A. Smith, and Deborah Fletcher Mello. The Diamond Literary Foundation is a non-profit organization dedicated to connecting multicultural authors with the community at large, specifically to promote diversity, empower women and foster leadership through creativity, reading, writing, and publishing. 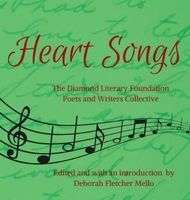 All proceeds from the sale of Heart Songs will benefit The Diamond Literary Foundation.